SINOPSIS: In his first Live in HD appearance as the Met’s Jeanette Lerman-Neubauer Music Director, Yannick Nézet-Séguin conducts Michael Mayer’s richly textured new production, featuring a dazzling 18th-century setting that changes with the seasons. 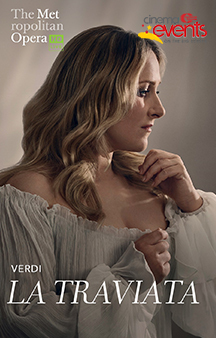 Soprano Diana Damrau plays the tragic heroine, Violetta, and tenor Juan Diego Flórez returns to the Met for the first time in five seasons to sing Alfredo, Violetta’s hapless lover. Baritone Quinn Kelsey is Alfredo’s father, Germont, who destroys their love.